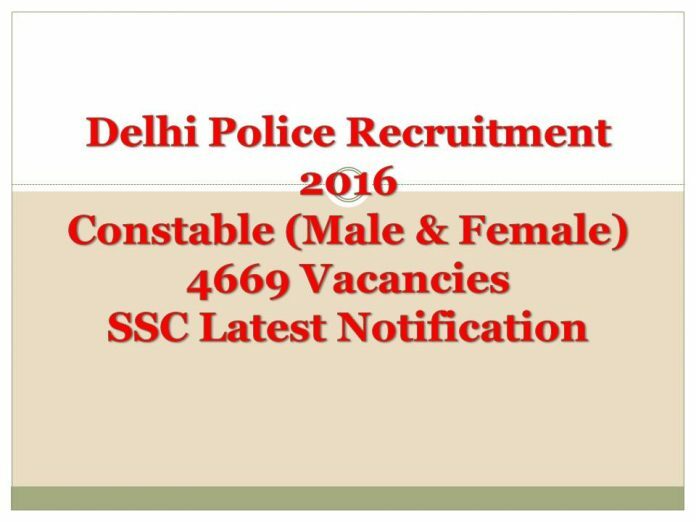 The latest recruitment news has released by the Staff Selection Commission, and the Delhi Police Department has issued the Delhi Police Recruitment 2016 for 4669 vacancies of Temporary Constable (Executive) Posts for both male and female candidates. Candidates who are probing for latest Delhi Constable Jobs and want to pursue their career in the police and paramilitary force can grab this opportunity. Delhi Police Department has finally published the Delhi Police Constable Notification and is about to start the recruitment process of 4669 vacancies of Constable (Male candidates- 3611 posts, Female candidates- 1058 posts). The details about Delhi Police Apply Online will be published in the Employment News or Rozgar Samachar on 10th September 2016. The application process will be done through online mode only. The Delhi Police Department was formed in the year 1861, is the leading law and order agency of the National Capital, Delhi. The head of Delhi Police is designated as Police Commissioner of the state. It has its headquarters at New Delhi, India. They are under control of Ministry of Home Affairs. They generally release the notifications for Constables, Sub-Inspectors, Head Constable (Ministerial), Assistant Sub Inspector (Stenographer), etc. They offer a number of opportunities for the youth of the country to get into the Police force. Staff Selection Commission will do the recruitment process. It is an organisation under the control of Government of India. The primary responsibility of this commission is to recruit staff for various posts in various Ministries and Departments of India. Well moving to acceptability details, the education qualification of candidates for this Delhi Police Recruitment 2016 should have completed 10+2/ Intermediate from any recognised board. Applicants should attain the age limit of 18 to 21years for male candidates and 18 to 25 years for female candidates. All eligible aspirants who are applying have to pay the application fee of Rs. 100 for OBC/General category and no fee for SC/ST/Female candidates. The selection process of Delhi Police Recruitment 2016 involves Physical Endurance Test and Measurement Test. Applicants qualified in these rounds will be called for Computer-Based written examination. The written exam will cover the questions on Reasoning, General Knowledge/Current Affairs and Numerical Ability. The written test will be conducted for 100 marks with a time span of 90 minutes. For more updates on Delhi Constable Jobs please the official website ssc.nic.in.